One downside to mobile check-ins for airlines is that flyers are bypassing attendants with their oversized luggage and airlines, unwilling to delay takeoff, will let the passenger on without paying the fee. 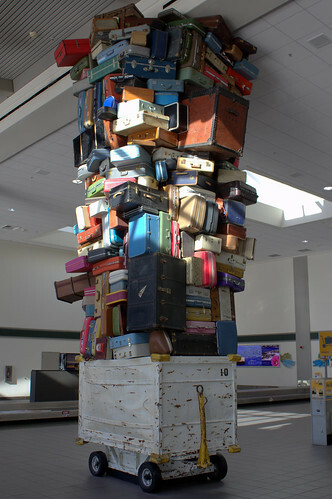 In the first six months of 2012, the nation’s largest airlines collected more than $1.7 billion in fees to check baggage. One way to avoid such fees is to fly an airline such as Southwest Airlines that doesn’t charge for the first two bags. The other way is more questionable. Eric Rose, a business consultant who travels frequently, came across the second method on a recent flight on Virgin America. He saw several passengers drag luggage that was too big for the overhead bin to the gate, only to have the gate attendant send the bags into the cargo hold without charging the passengers a check-back fee. The move saved the passengers a fee of $25 a bag. Rose pointed out the fee loophole in an email to Virgin America Chief Executive David Cush. Cush responded that the airline tries to spot passengers with too many bags at the security checkpoint. If they get to the gate with extra bags, he said attendants check the luggage without charging fees to avoid delays in loading planes. “Needless to say, people have figured out the drill,” Cush said. The airline said later that Cush stands by the statements he made in the email.